Centifolia Organic Moisturizing Cleansing Milk effectively removes impurities and make-up. Rich in antioxidant antioxidant ginkgo biloba, it protects the skin from free radicals and stimulates its regeneration. Made of aloe vera, it naturally hydrates your skin. Its creamy texture offers a gentle make-up removal and its soft composition does not irritate the eyes. 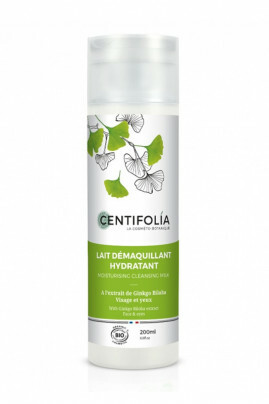 Thanks to Centifolia Organic Moisturizing Cleansing Milk, your skin is clean and hydrated! Centifolia Milk removes all traces of makeup! With your fingertips or with an organic cotton, apply organic cleansing milk on the face, eyes and neck. In order to perfect the makeup removal, we recommend applying the Centifolia moisturizing tonic lotion. Moisturizing Cleansing Milk is composed of organic ingredients! 32.8% of the total ingredients are from Organic Farming. 98.99% of the vegetable ingredients are certified organic.